Yesterday, I wrote an article (my regular weekly column) in the Times of South Africa, and it introduced some of the preliminary results of a quick analysis I did after that Facebook discussion. That is a very SA-centric piece, focused on our own situation and reaction to the Games, so please do bear that in mind before reminding me of the UK-GB difference between the Games – my context is South African. The reason I wondered about Commonwealth prestige, is that every four years, the Commonwealth Games represent a high-point midway through South Africa’s Olympic cycle. It’s our four-yearly celebration of our administrators for their excellent achievements (we win 30 to 40 medals, fairly consistently), before the inevitable Olympic downturn two years later, when the global reality bites back (we win between 1 and 6 medals. That’s usually followed by an inquisition, before nothing changes). We run this roller-coaster because we don’t fully ‘calibrate’ performances between the two Games, even though they’re clearly different. Yes, there’s considerable overlap between participants, but the obvious absence of the world’s sporting superpowers has to be factored in to the evaluation of performance. Failing to do this results in artificially inflated targets, the inefficient allocation of limited funding, and a general lack of “equity” in the intellectual understanding and management of our Olympic-focused high performance cycles. This message is propagated by the media, and thus heard by the public, who are never helped to understand the context of the Commonwealth Games in the global landscape, and how this affects Olympic success. Now, this is irrelevant from the perspective of the athlete. For them, a medal is a medal, and all should be celebrated equally – you can only beat the athletes before you, after all. Athletes have the ‘luxury’ of being able to, in a sense, compartmentalize the event before moving on to the next one. Win today, then next week, try to win again. Of course, every athlete is also working within a long-term framework, and so for different athletes, Commonwealth Games participation (and medals) mean different things – compare the reactions of say, Chad le Clos of South Africa who has won five medals in Glasgow to go with five in Delhi in 2010, with the reaction of a young up and coming swimmer who wins their first gold. For the latter, Commonwealth Games is a step along the pathway to the 2016 Olympic games, whereas for Le Clos, it’s the mid-term target on the same journey. Their pasts, and futures, influence the purpose of the Commonwealth Games. And so while the coach and athlete need to be working to a long term plan (I’ll never forgot seeing Bob Bowman’s 8-year plan for Michael Phelps at a conference in Colorado), they can also afford to compartmentalize and celebrate a performance for what it is, as should we. So, if a country has an Olympic focus (which they surely must do, at least at a high level), then from the perspective of sporting management and leadership, the Commonwealth and Olympic Games are linked together by one over-arching strategy, and so unlike the athlete and fan, they can’t be as neatly compartmentalized. I’d suggest it matters a great deal to develop a systematic method of calibrating Commonwealth achievements against desired Olympic performance. So, here are a few thoughts on how we (SA, specifically) might want to approach calibration of the Commonwealth Games. As a global multi-sport showpiece, the Commonwealth Games are dwarfed in terms of size, and thus medal competition, by the Olympics (71 nations in 17 sports vs 204 and 26 sports in London 2012 for example). The most notable absentees include the USA, China, who win 20% of the medals, and then most of Europe and Asia, who normally share approximately 60% of the available Olympic medals. What this means is that approximately four out of every five Olympic medals will be won by nations NOT at the Commonwealth Games. Looking more closely at the results, the best ten nations at the last three Commonwealth Games have won 92% of the medals – it’s very top-heavy, unlike the Olympics, where the top ten nations win around 50% of the medals. Those ten countries have won 15% of the Olympic medals over the same period. Olympic medal are thus six times more scarce to Commonwealth Games nations among these ten countries. Put differently, for every Olympic medal you target, these ten nations should, collectively, have six Commonwealth medals as a ‘base’. As expected, however, the Commonwealth calibration differs by country. South Africa has won 117 medals at the last three Commonwealth Games, but only 13 Olympic medals over the same period. Corrected for total available medals, that’s a ratio of 10.4, higher than the average, suggesting that we under-perform at the Olympics compared to the Commonwealth Games. Not quite as badly as India and Malaysia, mind you – combined, they’ve won 318 Commonwealth medals since 2002, but only 13 Olympic medals, meaning they are 28 times more likely to succeed at the Commonwealth Games. In contrast, Kenya and Jamaica are the most consistently successful nations, winning one Olympic medal for every 2.4 and 1.9 Commonwealth medals, respectively. That’s because they are so dominant in the narrow range of events where they do win medals (long-distance and sprint athletics), that even the addition of American, European and Asian competitors does little to dent their overall medal-winning capability. I’ve highlighted South Africa (the list is ordered by total Olympic medals), but you can pick any nation out. Note that I’ve included Great Britain in this list, and then tallied together all the contributing nations at the Commonwealth Games to make up their Commonwealth success. I recognize that the Commonwealth Games afford them more opportunities to enter athletes (GB, as it exists in the Olympics, can have perhaps twelve athletes entered in a given event at the Commonwealth Games). However, since I’m counting only medalists, there’s an assumption that the best three of those twelve would represent Team GB. Also, some of you may have already realized that taking a global view means you are including sports that are not necessarily common – netball and lawn bowls don’t feature at the Olympics, whereas rowing and kayaking are not in the Commonwealth Games. Also, the Commonwealth Games now include paralympic events, whereas the Olympics do not. These differences go some of the way towards explaining why certain nations have very high or low ratios – if a country is dominant in Commonwealth-exclusive events (like lawnbowls), their Commonwealth:Olympic ratio will be higher. That’s why a more detailed analysis would compare sports that feature in both events (as I’ve done below). Finally, the reason I’ve limited the analysis to the last three cycles is because high-level Olympic strategies change over periods of twelve years. For instance, Great Britain’s performance in 1996 was the catalyst for their investment in Olympic success, which culminated in hosting and dominating so many events in London 2012. China achieved a similar dominance in 2008, part of a long-term strategy, and so casting the net too wide may invite some confounding factors. So, you’d obviously want to drill down even further to understand how that ratio is determined, and that’s certainly possible for each country to do. You’ll (I hope) forgive me for not going to that level). There are also, unsurprisingly, differences between sports, and this is where basically all the nuance exists. Certain sports are stronger at the Commonwealth Games than others, and even with sports, certain events are stronger (field events in athletics, for instance). Naturally, sports that are exclusive to the Commonwealth Games, like netball and lawn-bowls, are very challenging to win, but the most objectively competitive Commonwealth Games event is men’s Rugby Sevens, because it features every country in the top 8 of the World rankings. 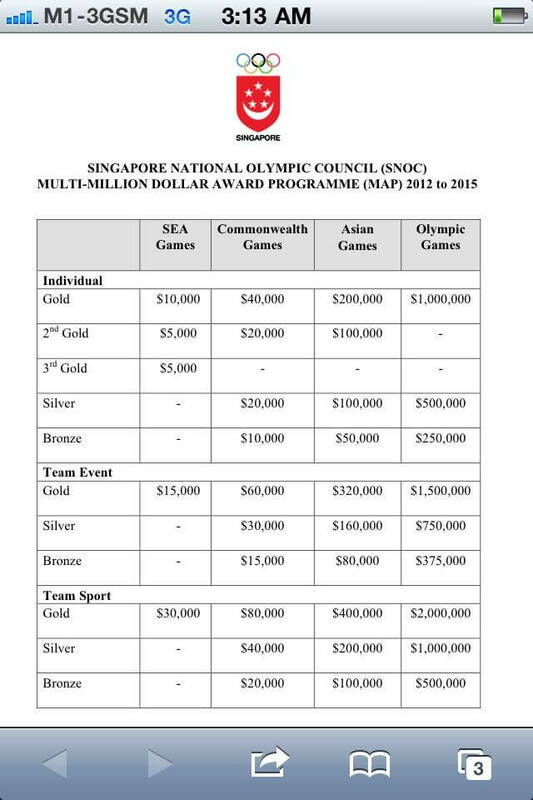 Once it enters the Olympics in 2016, it is highly unlikely that even one medal will be won by a non-Commonwealth nation. Compare this to technical and combat sports like shooting, archery, wrestling and judo, where the world rankings and world champion and Olympic results will show that Commonwealth nations are very much outgunned on the global stage. 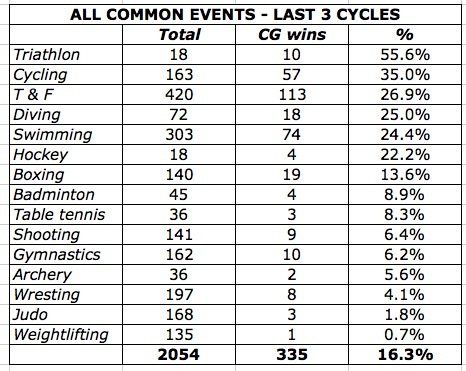 So triathlon is the ‘strongest’ event, though this is a little confounded by the fact that there are only six medals on offer per Olympic Games, and the historical strength of Australia and New Zealand has meant over half the medals go to CG nations. Now it’s England, who accounted for four of the six Commonwealth medals, and would have a realistic chance of winning that many in an Olympic Games held right now too. As for South Africa, there are a couple of factors that explain why our ratio is greater than the average of the Top 10. First, the presence of paralympic events in the Commonwealth Games inflates our Commonwealth medal tally, because we are historically strong in those events. We can’t add to our Olympic tally in this way (though we do of course do well in the Paralympic Games). Add a few medals in bowls, and then a handful of judo and wrestling medals, not replicated at the Olympics, and our ratio is increased. And finally, we’ve achieved greatest success in swimming, but don’t quite have the quality to defend those medals when the USA and Europe are added to the pool. There are of course other ways to benchmark performances, and all should be used. I’ve already alluded to the world rankings, which is the most obvious way of contextualizing a Commonwealth Games result. It is however, only one pixel in the picture. For example, if a hockey team is ranked 10th, but wins a Commonwealth medal, does it make them viable Olympic medal prospects? The answers to such questions are not trivial, for they influence where money is allocated. In some sports, the so-called cgs ones, which are measured by centimeters, grams and seconds (like long jump, weight lifting and cycling, swimming and running), benchmarking is even easier – just look at the athlete on the world-ranking lists and you’ll have a very good idea of how to ‘calibrate’ the Commonwealth performance. Take the 100m winning performance of Kemar Bailey-Cole last night – a winning time of 10.00s is objectively comparable to times from last year’s world championships, and the world ranking lists (it would’ve been good enough for 6th, and is 22nd in the world this year). The problem with this is that you’re comparing across potentially influential conditions and disregarding that aspect of performance where you have to “deliver on the day”. For this reason, blindly following rankings and benchmarking only by this criteria is incomplete. The other method that offers value is to characterize all Olympic medalists and finalists in the years leading up to the Games. For example, if a person is going to win an Olympic medal, where must they be ranked three, two and one year out from the Games? To what extent does their performance in the World Championships two years and one year before the Olympics predict their success? What are the typical ages, masses, experience of the athletes who do win medals, and do they differ from those who merely reach finals but leave without medals? For Commonwealth nations, the Commonwealth games is another opportunity to ask and answer questions like this, just one of many methods of evaluating current vs desired performance, and which allow budgeting and tactical decisions to be made within a broader strategic framework. That framework would then recognize that the true value of the Commonwealth Games for many athletes may be to expose them to a multi-sport event, complete with athlete village, as part of their desired journey to the Olympics. Experience is never a wasted investment, and so the Commonwealth Games affords us with the luxury of this investment. However, some form of measurement and benchmarking is still important to track the possible return on that investment. At the risk of being blunt, if you control the budget of an Olympic nation, do you evaluate a young weight-lifter and a young boxer similarly if they both return with a silver medal from Commonwealth Games? Once again, your tactical decisions are blind in the absence of some calibration. Ultimately, even tackling the exercise of performance analysis builds intellectual capital. It’s an investment in equity, and it’s the reason successful nations like the UK have entire divisions whose purpose is to understand the pathway to Olympic success, which nodes exists, where the roadblocks are, and how they may be avoided. The alternative is navigating through the darkness.